Born in Pontevedra in 1957, Manolo Paz was trained at Santiago de Compostela’s Mestre Mateo School of Arts and Crafts in the late 1970s. Since the early 1980s, his work has shown a bold combination of carving and stonemasonry basic skills and growing awareness of artistic autonomy, problematising stone as a medium of particular significance. In addition to this distinctive feature of his sculptural practice, Paz is also concerned with the value of autochthonous culture (its symbols, signs and materials, such as granite), as well as with the ongoing dialogue established with the memory of those places where he has worked. This Galician artist’s production since the early 1990s, Familia included, has repeatedly shown his approach to a more rational formal grammar, experimenting with balance, tensions, replicated volumes and horizontal over vertical stability. 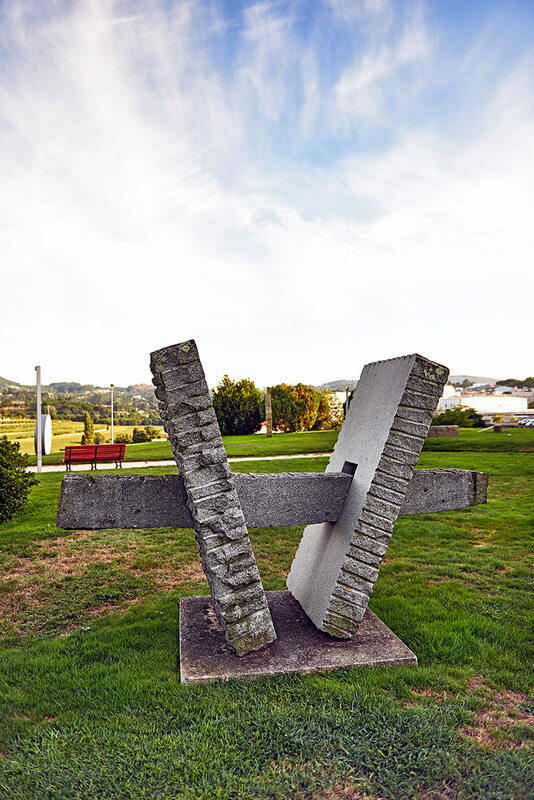 In Familia [Family], Paz remains faithful to his programmatic guidelines, by building a sculpture in which the stability of its horizontal element is given through the tension of two diagonal blocks leaning in opposite directions. His geometric vocabulary has thus been radicalised, in his search of both the perfection and coldness of industrial methods and of the emotional, telluric value of hand-produced textures. From this tight-knit relationship between volumes and textures, Manolo Paz has built a simple structure resembling and inverted capital A, whose crossing bar may be seen as a horizon line defining, together with the other two open lines, the sides of a framework through which the surrounding landscape can be taken it. Also noteworthy is the presence of discrete grooves in the fashion of ancient stone carvings, through which the sculpture marks the site.